Well-appointed cabin, approx. 1200 sq. ft. on one floor with a loft - walking distance to restaurants, bars, and a playground. Master bedroom with antique Queen bed. 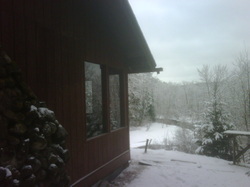 Open concept living room/dining room overlooking the beautiful Brule River. Dining table comfortably seats 6. Dishwasher, oven, microwave, and gas range, toaster, coffee-maker. Washer/dryer on premises, plus weekly cleaning maintenance. 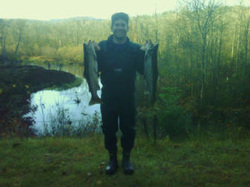 Flyfish from the shores on property of both the big and little Brule Rivers. The little Brule is perfect to get the kids excited about fishing and move them up the Big Brule. 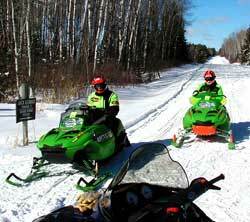 Easily drive your snowmobile to the trails. Great Cross Country Skiing at the afterhours trail. Northern WI is home to some of the biggest white tail bucks in the area with over 2000 acres of public land abutting the property (many monsters onsite, but those are pets). The Bois Brule River is one of Wisconsin's most famous and scenic trout streams. Due to its size, highly productive, self-sustaining fishery, and steady flow of cool spring water, the Brule is considered one of the premier trout streams in the lake states. It has attracted anglers locally, regionally and nationally, even serving as a retreat for several U.S. presidents and other dignitaries. Today, the Bois Brule River draws an estimated 33,000 fishermen annually. Go no further to find the Best Cabin for Fly Fishing West of the Mississippi. Brule River State Forest - Recreation - Canoeing and Kayaking Whether you are in the mood for a peaceful float with the family or the challenge of an exciting ride through whitewater, the Bois Brule River in northern Wisconsin can meet your expectations. This unique, 44-mile-long river varies from a meandering stream in a conifer bog to a fast-flowing river with numerous rapids and ledges. As it flows north, the Brule River drops 418 feet in elevation, plunging 328 feet in just the last 19 miles. A Variety of Canoe/Kayak Experiences The Bois Brule River offers easy-going trips on the upper river, particularly from Stones Bridge to Winneboujou, that nearly anyone can handle. More adventurous folks can stay on the river another 45 minutes and experience Little Joe Rapids, a modest class II rapids located just upstream of the Bois Brule Canoe Landing. Still more daring canoeists, and most kayakers, prefer the river north of Pine Tree Landing to the Highway 13 Landing. This stretch of river will take paddlers through nearly continuous stretches of riffles, ledges and rapids. Canoe Rental A canoe rental outfit located in Brule rents out both canoes and kayaks. This business also offer several trips and can pick up or drop off people and canoes. 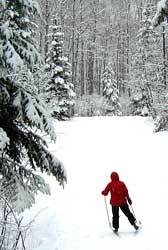 The Brule River State Forest includes an extensive network of some of the region's finest and best maintained cross-country ski trails for both classical and skate skiing. Various loops provide a variety of terrain suitable for both beginning skiers and those with advanced skills. The scenic Bois Brule River can be seen from the River and White Pine trails. At the trailhead, visitors will find restroom facilities and a warming shelter jointly maintained by the forest and the Brule Valley Ski Club.